Follows the Game Dev of Blue Box. You might have wondered why it has been so long. One of the reasons is because my Unity Workspace is becoming so cluttered, so I'm starting again. I still have all the scripts, Objects, Textures, Levels, etc. It just means I'm arranging the Folders neatly. This will take sometime. I'm keeping this post short and simple. So it's been quite some time since I did my last post and just to notify you, I'm back into my game. I will have several other projects e.g. A 5 second project, A music video, Original art. I decided to give you an update on something I decided to remove from the game, but found again and perfected it and fixed it up. Water. In the first part of the game, there will be two types of water. Icy and Clear. Icy water makes the cubes sink really fast. It pulls things to the bottom. Clear water, with some momentum, brings the cube to the top and lets it bounce around until eventually sinking down. The confusing thing is that the player doesn't interact with the water, nor does the faulty cube. When a cube touches either the Icy or Normal water, it peels off displaying some of the inner parts. 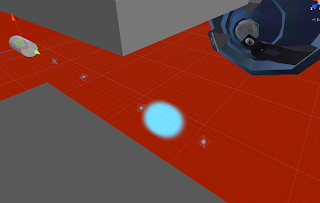 This post is going to be about the Blip Beam in the game. Have a look at this video from 0:20 to 0:40. You see how there is a pellet which hits a receptor which activates a piston. Well at the start I wanted to make one. So I had one of those pellets which after one dies, another spawns. The pellet has to hit the receptor to activate something. I soon realized that was an unoriginal idea. So I put it into my own hands to add a stream which goes with the pellet. Now I decided that when the pellet hits the receptor it opens up a gateway for the stream to pass through. I could execute this well in levels. Need to open a door? Stand in a position so the beam redirects into the receptor. The pellet will hit the receptor, causing the door to break open a lock. The door has one more barrier. As the stream is fired onto the receptor, the door will slowly start opening. If you stop the stream from hitting the receptor, the door will close instantly. Once the door is opened, you fire through the open door hitting a panel. The panel spawns a cube which flings across a chute and lands down into where you were standing, redirecting the stream into the receptor. The door is now fixed open until the cube despawns. Each platform has a limit of cubes you spawn before you have to reset to spawn anymore cubes at that wall. The lower the limit of cubes, the higher frequency the faulty cubes spawn. 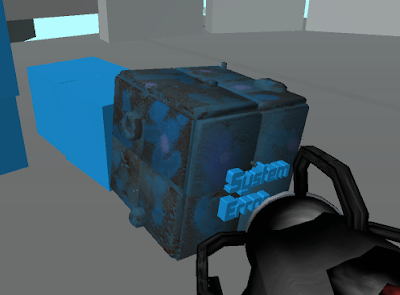 To tell you what is happening, every cube you spawn, the 'random faulty cube' dice is tossed. The script says that the range of the random faulty cube is the cube limit plus one. Say you have a cube limit of 2, the random faulty cube range will be 3. That means there is 0.33% chance that out of the two cubes spawned, one will be a faulty cube (1-(2 divided by 3)). So what if the cube limit is 29? The random range will be 30. That means there will be a 0.033 percent chance there will be a faulty cube spawned (1-(29 divided by 30)). The chances get smaller the bigger the cube limit. So, if you've had a look at the videos where I hit the Pause time receptor and there is a blue texture, well I've decided with all screen effects, I'm going to have a rather pixel look e.g. Going into water. Limited Free Version? I think not! Wow, a lot of stuff! The difference between an object marked 'Done' and one marked 'Scripted' is that Done ones have been scripted and textured and amplified and whatever else. If you look at the object list, you will see there is a 'Sound Emmiter Loudspeaker'. The Loud Speaker takes up one platform and it is meant so that if a player walks into a test, there has to be at least some sound otherwise it will seem bland but if I have a rhythm randomly playing, players will question why. So those Sound Emmiters pretty much explain why. If you want to see how it moves, you can catch glimpses of it in the source video. When a box touches the net, it will be flung fast in the destination direction. It will be very fun to use when level designing! Oooh yes, my favorite game object I've created (besides from the Pause time Receptors). the Landing Position. This was one of my most stressful script I've had to do. At first I was confused about getting the player to move towards it rather than teleport to the destination. Then I got absolutely insane when I thought it was about a SendMessage (My arch enemy) script to the Player changing some Airborne values. Eventually I found out about this crazy yet useful script node, 'Vector 3', which then had a 'Move Towards' added to it and a Boolean stating if its hit and after a few hours I developed a simple yet stressful code for the Velocity Gate. Oh and I did something with a speed value. Well, it was a rewarding experience, especially after hundreds of failed attempts. To go with the velocity gate, I wanted a motion blur, but no, Unity Pro has all the screen effects rather than my Unity Free. Well I was like, I don't care and I set out on a quest to figure out how to do this 'motion blur boost effect'. I soon realized that to have a motion blur freely, you have to make all the geometry in the scene deform. I was not prepared to animate everything, so I decided that to do the effect, I could have a zoom in effect. I realized to do that, I can have cloud particle effects running quickly across the screen forcing the players view point to be the center. Took time but I figured it out.